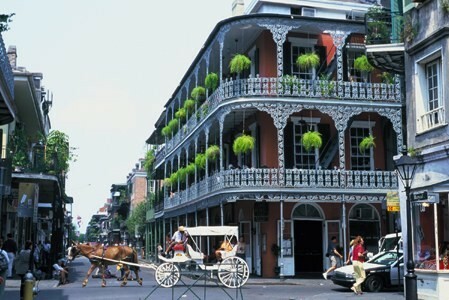 On this escorted vacation you will enjoy a tour of the French Quarter, where all the old French, Spanish and Creole splendor are preserved, and visit market places, wharves, dueling places, millionaire homes and dramatic gardens. And after visits to Jack London’s Square, the Garden District, Saint Louis Cemetery and City Park it’s time to roll up your sleeves and create – at the New Orleans Cooking School, where we’ve arranged for you to be the CHEF! This fun filled culinary class will have you cutting, chopping, and sautéing a full meal. You will receive the recipes and a New Orleans School of Cooking apron too. After all your hard work, you are free to enjoy the house red or white wine, Abita beer or lemonade, iced tea, and coffee and dine on what you have created – and how cool is that! What a perfect place to bring out the inner “foodie” in you and share in an absolutely great time as well. Since 1980, the New Orleans School of Cooking has introduced countless visitors from around the world to the wonderful world of food – Louisiana and New Orleans style. The entertaining cooking classes are taught by well-known local chefs; skilled in the arts and traditions of Cajun and Creole cuisine. On this escorted mini-vacation you (the chef) will be treated to a wide range of local classics. You will learn the basics of Louisiana Cooking in a way you’ll never forget. Fun is a primary ingredient in this kitchen! The Creole/Cajun experts teach New Orleans specialties such as Gumbo, Jambalaya and Pralines, and all the recipes are seasoned with history, trivia and tall tales. It’s a “ga-ron-teed” good time for all. Let’s talk about something the locals wish you wouldn’t find out about – just so they can keep more to themselves. Always part of the first meal of the day, and often part of the last thing you think about before you go to sleep, is coffee and dessert. This is some of the best eating you’ll do when in New Orleans. The New Orleans School of Cooking has coffee and sweets in stock in their general store, and you can buy them for your own personal use or bring them home as souvenirs for your friends who weren’t smart enough to book this trip. When you choose to take home a little piece of New Orleans, you can blend up some delicious New Orleans coffee, close your eyes and be right back in the city – do you hear those tenor saxophones on Bourbon Street? Take a look at the attached full itinerary and mark your calendars to include this truly fun-filled adventure to the Big Easy – you’ll thank yourself!